After driving nearly seven hours to get to Stowe, Vermont, on a Friday afternoon, I wondered for a moment if the long trip had been worthwhile. Our destination was Stoweflake Mountain Resort & Spa, only two hours from the Canadian border. My doubts dissipated as soon as we crossed the state line — Vermont is simply sublime, with rolling mountains, lush greenery, waterfalls, walking paths, antiques shops and countless opportunities to explore nature. And Stoweflake is an extension of Vermont’s beauty. Stoweflake is located in Northern Vermont, just 36 miles from Burlington. It’s a reasonable drive from New York City, Boston, Hartford, Albany and Montreal. Also within driving distance are Ben & Jerry’s Factory Tour, the Cabot Creamery and the Cold Hollow Cider Mill. The resort exudes charming New England style in every regard: decor, gardens, warm staff, activities and onsite dining. My family was instantly made to feel welcome at reception, and concierge Suzi gave us the lowdown on what to do during our time at the resort — she’s one of the nicest concierges I’ve ever come across. The weekend offered something for everyone in my clan, from a 10-mile bike ride and a classic auto show to a luxurious spa treatment and family time in the game room. If you want to visit during a special time of year, the resort hosts the annual Stoweflake Hot Air Balloon Festival, a 3-day event, every July. Stoweflake includes 120 upscale guestrooms and suites, as well as kid-friendly townhouses. It’s family-run, and the staff takes great pride in the resort. Our room was cozy and spacious and had a luxurious, classic feel, with an armoire, a gas fireplace and leather armchairs. The top-quality bedding was a highlight; my children and I agreed that it was one of the most comfortable nights we’ve ever spent in a hotel. Other in-room amenities include complimentary WIFI, a refrigerator where we could store blueberries picked directly from the resort’s garden, a flat-screen TV, a Keurig coffeemaker, bathrobes and a writing desk. There are a variety of options for cuisine at the resort, and we enjoyed them all. We had breakfast in the main dining room at Charlie B’s (named after owner Chuck Baraw), which offered a wide variety of scrumptious items. Lunch was spent poolside, with healthy salads, soup, turkey burgers and hummus plates. Back at Charlie B’s for dinner, our delicious appetizers included ninja duck rolls, French onion soup, chicken wings and tuna tartare. Everything was tasty and made to order, and the kids had a variety of choices — they could either order half portions of adult food or off the kid’s menu. The kind, chatty servers and managers in each restaurant accentuated our dining experiences. As the weekend progressed, we got to know many of the resort staff and the experience became quite familial. Stoweflake offers much to do, both onsite and in the local area. One thing that’s quite special on the property is a beautiful meditation garden where guests can stroll, sit, or pick blueberries and other edible plants (Suzi advised us which ones were safe to eat). We also made good use of amenities such as the pools, the family game room and the gym. One day, we rented bikes and rode 10 miles on the nearby recreational path. The paved path starts in Stowe Village, winds its way through forests and meadows, and crosses the West Branch River 11 times on arched wooden bridges. There is plenty of local hiking in the area as well, either locally or follow the Long Trail south from Smugglers’ Notch up Mt. Mansfield. The resort offers golf, childcare and, of course, in the winter, proximity to the best area ski resorts. We happened to be there for the annual classic auto show, and all weekend we witnessed cars from the turn of the century riding through town. The hotel is less than two miles from the heart of Stowe, full of shops that offer art, jewelry, nationally recognized crafts, handcrafted furniture, award-winning specialty foods, clothing and sports equipment. The Spa at Stoweflake was voted a Top Resort Spa by Conde Nast Traveler, and after spending several hours there, it’s easy to see why. This mom had a glorious afternoon utilizing the spa, luxuriating under the Bingham Falls cascading waterfall, soaking in the hot tub and burning fat in the steam room. The menu includes 150 treatments created with indigenous products; I selected the 80-minute Vermont Maple Sugar Body Polish. I can honestly say that my spirit was lifted after having a childless, carefree, luxurious afternoon. 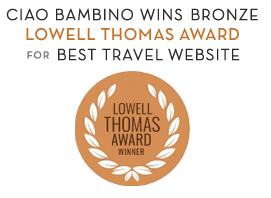 Want help booking a stay at Stoweflake or planning a family trip to Vermont? Editor’s Note: Holly experienced Stoweflake as part of a media trip. As always, our thoughts and opinions are our own. Photos by Holly Rosen Fink.